Background: Iron nanoparticles (FeNPs) have got many biomedical and health applications because of biocompatible and nontoxic nature to humans. Objective: To synthesize the FeNPs using natural sources. Materials and Methods: In this study, simple and economical procedure was adopted for FeNPs synthesis. Sesame seeds were processed to obtain seed extract as a biological material for FeNPs production. FeNPs were characterized by Fourier transform infrared spectroscopy, X-ray diffraction, and scanning electron microscopic. Results: The average diameter of these FeNPs was 99 nm. These nanoparticles showed significant anti-typhoid activity (30 mm zone of inhibition) as compared to ciprofloxacin (32 mm) as standard. Furthermore, in vitro alpha-amylase inhibitory assay also showed moderate antidiabetic activity with more than 50% inhibition. Conclusion: This study would be helpful in understanding of nanoparticles synthesis from natural sources and ultimately will be used as potential alternative therapeutic agents. Abbreviations used: FeNPs: Iron Nano Particles; SEM: Scanning Electron Microscopy; MIC: Minimum Inhibitory Concentration; S. indicum: Sesamum Indicum. These FeNPs can be used as antidiabetic agent. Iron nanoparticles (FeNPs) are more economical, physiological, compatible, safe as compared to gold, silver, and other nanoparticles. Clinical data on biodistribution, clearance, and biocompatibility of FeNPs ensure their safe clinical use. These particles have received remarkable attention for its characterization due to its potential applications and hence many analytical methods available for its characterization. In this study, pharmacological active FeNPs were readily and efficiently produced using sesame (Sesamum indicum) as a reducing agent. Advantage of this procedure is no need of any corrosive, toxic chemical. Products obtained by this method are safe for human use as biomedical applications. This method is more preferable than other methods where high energy, temperature, pressure, and toxic or harmful chemicals required and other significant advantages of this method are easily scaled up for bulk synthesis, cost-effective, and environmental friendly., The biological activities indicate outstanding pharmacological features of these FeNPs particles, therefore, increases its significance and value in biotechnological and pharmaceutical industry. In this study, the S. indicum seeds collected from local agriculture store. Seeds samples stored in an amber glass container after crushing and then used for extraction process. FeNPs were synthesized, characterized, and biologically analyzed. S. indicum seeds of 100 g were gently grinded in mortar and pestle and then soaked with 300 ml sodium hypochlorite (bleach) solution (30%) for 7 min for sterilization; after that, bleach removed and sample rinsed with sterile distilled water for three times. Seeds sample soaked with 300 ml of 70% ethanol for 2 min and this ethanol was removed. Seed sample further six times rinsed with sterile distilled water. Disinfected seed sample added in sterile distilled water (proportion volume 1:2) and incubated at 25°C for 7 days in amber glass bottle. Now, after incubation, prepared seeds extract filtered by No. 40 Whatman filter papers and then stored in amber glass bottle in refrigerator. Equal volume ratio of 0.1 M FeCl3 solution and prepared seed extract (1:1) was added in a beaker by continuous stirring for 60 min and kept mixture for half an hour at room temperature and finally centrifuged for 8 min at 12,000 rpm. Supernatant was removed and precipitates collected. Sample was gently ground and diluted in nonabsorbent KBr matrices, and Fourier transform infrared spectroscopy (FTIR) spectrum of FeNPs was recorded over the range of 450–4000 cm −1 by FTIR spectrophotometer (Alpha-P Bruker, Germany). Scanning electron microscopic (SEM) analysis of FeNPs was carried out using Philips scanning microscope (Philips XL-30 FEG-SEM) type instrument. FeNPs were smeared onto carbon adhesive tapes which supported on metallic disks, and then their images were recorded at different magnifications. The synthesized FeNPs were tested against Salmonella typhi, a causative agent of typhoid by standard well diffusion assay. We prepared nutrient agar Petri plates by dissolving 14 g agar in 500 ml distilled water and autoclaved. Similarly, nutrient broth (0.45 g) was prepared by taking 0.45 g in 50 ml distilled water and sterilized. We added 0.5 ml of BaCl2 (1.175%) dropwise in 85 ml of H2 SO4 (1%) with continuous stirring and volume was adjusted to 100 ml with 1% H2 SO4. This solution was used to analyze the transparency level of diluted inoculum. We prepared inoculum culturing S. typhi in nutrient broth (25 ml) and incubated at 37°C for 24 h. Sterilized normal saline solution was added into inoculating test tube until transparency level matches McFarland solution. Stock sample (1000 μg/ml) was serially diluted: 500, 250, 125, and 62.5 μg/ml for evaluation of minimum inhibitory concentration (MIC) of FeNPs. The inoculum of S. typhi was spread onto the surface of sterilized nutrient agar Petri plates using sterile cotton swab; the wells were formed with the help of 6 mm stainless steel borer, and then sample and standard ciprofloxacin were loaded into respective wells. These Petri plates were incubated at 37°C for 24 h and zone of inhibition were measured. Starch (1.2 ml) in the phosphate buffer having pH 6.9 also containing 6.7 mM NaCl was added to 600 μl of (10, 20, 40, 60, 80, 100 μg/ml) the synthesized FeNPs. A volume of 60 μl of porcine pancreatic amylase was also added in it, and hence, reaction started and incubated at 37°C. In 600 μl of above mixture, 300 μl 3,5-dinitrosalicylic acid was added and further kept in boiling water bath for 15 min. Furthermore, reaction mixture diluted by adding 2.7 ml water and then finally absorbance was recorded at 540 nm. Then, blank tubes were also prepared by adding 600 μl distilled water instead of enzyme solution for each concentration. Finally, control was prepared without FeNPs and it representing 100% enzyme activity. This experiment was repeated for three times with the same protocol. Ab = a blank absorbance (a test sample without enzyme). Biological active FeNPs were successfully produced using S. indicum seeds. FTIR spectroscopy used for identification of the functional groups based on spectral peaks. 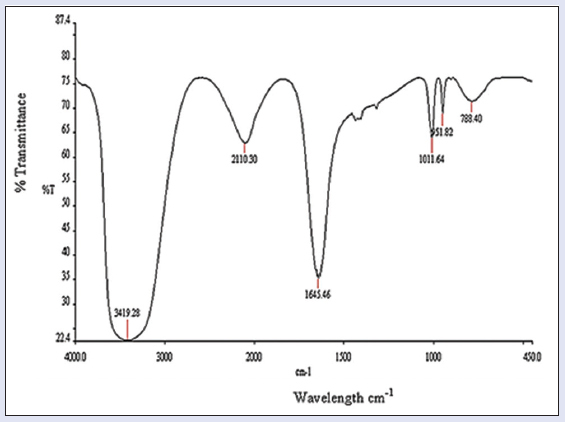 [Figure 1] shows FeNPs spectra and absorbance bands have been observed in the region of 3419.28, 2110.30, 1645.46, 1011.64, 951.82, and 788.40 cm −1 which confirmed O-H group (strong band, broad intensity while stretching), alkyne group (stretching vibration), amide (C = O, strong band, stretching), ether (C-O, stretching), alkene (=C-H, bending), alkyl halide (stretching and strong band), respectively. SEM micrographs of biosynthesized FeNPs have been shown at magnifications of 1.01 kx, 5.0 kx, 10.0 kx, 25.0 kx, and 50.0 kx [Figure 2]a and the size of FeNPs were found 99 nm [Figure 2]b and round and well monodisperse. We observed various peaks at different angles (2θ) 24.6°, 34.8°, 41.9°, 46.1°, 52.5°, 61.8° [Figure 2]c. These peaks exhibited the intensity of FeNPs and the size of these nanoparticles was obtained using the Debye-Scherrer formula: D = K λ/β Cosθ, where D is the mean diameter of nanoparticles, β = the full width at half-maximum value of XRD diffraction line, λ = the wavelength of X-ray radiation source 0.15405 nm, θ = the half diffraction angle–Bragg angle, K = the Scherrer constant with the value 0.9. The synthesized FeNPs were tested against S. typhi, a causative agent of typhoid by standard well-diffusion assay. The antibacterial activity of FeNPs showed [Figure 3]a significant zone of inhibition against S. typhi. The ciprofloxacin (standard) showed the clear zone of inhibition, i.e., 32 mm while FeNPs exhibited 30 mm. 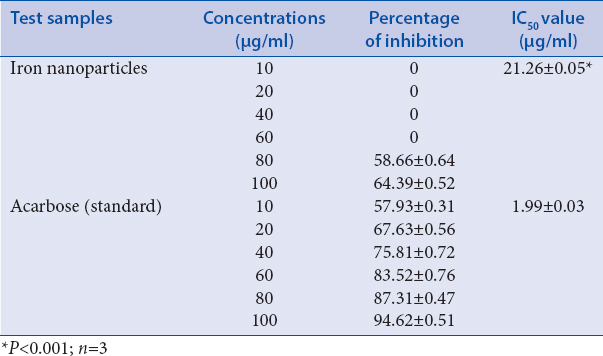 Acarbose used as a standard at a concentration of (10–100 μg/ml) showed α-amylase inhibitory activity from 57.93 ± 0.31% to 94.62 ± 0.51% with IC50 value 1.99 μg/ml [Table 1]. FeNPs at a concentration of (10–100 μg/ml) exhibited α-amylase inhibition activity in a dose-dependent manner. The FeNPs expressed the highest the inhibitory activity, i.e., 64.39 ± 0.52% with IC50 value of 21.26 μg/ml. The methods of preparing FeNPs by chemical means are not satisfactory because these methods are fraught with various problems such as high-energy consumption, toxic chemicals, and unwanted by-products. Mercury-based methods used for FeNPs synthesis, but due to toxic mercury vapors, these methods replaced with other methods, i.e., organic solvent-based methods. Therefore, the safety and health concerns are associated with this reduction approach., Thermal decomposition of iron pentacarbonyl method for synthesis of FeNPs is the complicated reaction. Surfactant is required for this method that increases the cost of synthetic procedure. Heat and an efficient system are used to remove by-products. Many microemulsion procedures can be employed for the synthesis of FeNPs, but it is not usually preferred due to oxidation problems. In this study, we used seeds extract as biological material for FeNPs synthesis to avoid all these chemicals hazardous effects reported previously. Seeds extract was used as reducing agent as well as stabilizing agent. We adopted a single step, easy, and rapid procedure for FeNPs synthesis that is the most considered method and simple approach. In this procedure, there is no need of any corrosive, toxic, flammable chemical as in the case of chemical synthetic procedures. Products obtained by this method are safe for human use as biomedical applications because there is no chance of toxic chemical absorption on their surfaces. More importantly, it is inexpensive and environmentally benign, nontoxic products treatment, and size-controlled NPs at mild conditions. The nanoparticles were characterized using XRD technology which is an effective way to confirm the crystal structure of particles. XRD and SEM micrographs show morphological details of FeNPs, revealing spherical shape with average size of 99 nm. The SEM size of FeNPs (99 nm) showed variations in peaks during diffraction analysis at different angles (2θ) 24.6°, 34.8°, 41.9°, 46.1°, 52.5°, 61.8°. The size of these nanoparticles was obtained using the Debye-Scherrer formula. The XRD profile and electron scanning pattern show that FeNPs with body-centered cubic structure are formed. Therefore, this study helps to understand the relationship between the surface topography and functional characteristics. We analyzed and found these nanoparticles biological active against typhoid. In spite of many anti-typhoid products are available in market such as cephalosporin, fluoroquinolone, azithromycin, and chloramphenicol, these antibiotics have bacterial resistance and costly. We used ciprofloxacin as standard drug, and our results proved that active FeNPs are effective against typhoid. Our results showed significant anti-typhoid activity with 32 mm of zone of inhibition against S. typhi. Metabolic disorder such as diabetes mellitus is another major problem in the world. During antidiabetic analysis, these particles showed average to moderate inhibition for α-amylase enzyme. FeNPs are successfully biosynthesized by rapid, simple, and cost-effective method using the sesame (S. indicum) seeds extract. The average diameter of FeNPs was 99 nm. Particles were spherical and well monodisperse. These biological active particles are effective for typhoid and diabetes. Such green methods are helpful for the synthesis of safe and nontoxic nanoparticles that can play a potential in biomedical sciences. Ramsden J. Applied Nanotechnology: The Conversion of Research Results to Products. 2nd ed. USA: Elsevier; 2014. Sahoo SK, Labhasetwar V. Nanotech approaches to drug delivery and imaging. Drug Discov Today 2003;8:1112-20. Silva GA. Nanotechnology approaches for drug and small molecule delivery across the blood brain barrier. Surg Neurol 2007;67:113-6. Jain TK, Reddy MK, Morales MA, Leslie-Pelecky DL, Labhasetwar V. Biodistribution, clearance, and biocompatibility of iron oxide magnetic nanoparticles in rats. Mol Pharm 2008;5:316-27. Mahdavi M, Namvar F, Ahmad MB, Mohamad R. Green biosynthesis and characterization of magnetic iron oxide (Fe3O4) nanoparticles using seaweed (Sargassum muticum) aqueous extract. Molecules 2013;18:5954-64. Iravani S. Green synthesis of metal nanoparticles using plants. Green Chem 2011;13:2638-50. Shahwan T, Sirriah SA, Nairat M, Boyacı E, Eroǧlu AE, Scott TB, et al. Green synthesis of iron nanoparticles and their application as a Fenton-like catalyst for the degradation of aqueous pollutants. Chem Eng J 2011;172:258-66. Jain D, Daima HK, Kachhwaha S, Kothari S. Synthesis of plant-mediated silver nanoparticles using papaya fruit extract and evaluation of their anti microbial activities. Dig J Nanomater Biostruct 2009;4:557-63. Shirmohammadi E, Bagheri GR, Saeidi S, Mohasseli T, Mohkami Z, Baigi GS, et al. The antibacterial activity of silver nanoparticles produced in the plant Sesamum indicum seed extract, green method against multi-drug resistant Klebsiella pneumoniae. Eur J Exp Bio 2014;4:197-200. Basly B, Felder-Flesch D, Perriat P, Billotey C, Taleb J, Pourroy G, et al. Dendronized iron oxide nanoparticles as contrast agents for MRI. Chem Commun (Camb) 2010;46:985-7. Sun YP, Li XQ, Cao J, Zhang WX, Wang HP. Characterization of zero-valent iron nanoparticles. Adv Colloid Interface Sci 2006;120:47-56. Abayomi M, Adebayo AS, Bennett D, Porter R, Campbell JS, Dawkin G. In vitro antioxidant activity of Bixa orellana (Annatto) seed extract. Br J Pharm Res 2014;4:1387-99. Rodriguez-Tudela J, Barchiesi F, Bille J, Chryssanthou E, Cuenca-Estrella M, Denning D, et al. Method for the determination of minimum inhibitory concentration (MIC) by broth dilution of fermentative yeast. Clin Microbiol Infect 2003;9:i-viii. Parekh J, Chanda SV.In vitro antimicrobial activity and phytochemical analysis of some Indian medicinal plants. Turk J Biol 2007;31:53-8. Hansawasdi C, Kawabata J, Kasai T. Alpha-amylase inhibitors from roselle (Hibiscus sabdariffa Linn.) tea. Biosci Biotechnol Biochem 2000;64:1041-3. Huber DL. Synthesis, properties, and applications of iron nanoparticles. Small 2005;1:482-501. Li XQ, Elliott DW, Zhang WX. Zero-valent iron nanoparticles for abatement of environmental pollutants: Materials and engineering aspects. Crit Rev Solid State Mater Sci 2006;31:111-22.